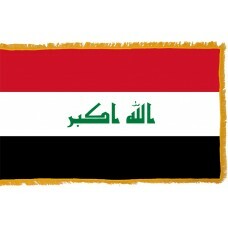 The flag of Iraq is a tricolor consisting of red, white and black horizontal sections of equal size. The takbir is featured in the white central section of the flag in green Kufic script. This has been used since July 31st, 1963 with some minor changes to the green symbols. In 1921, modern Iraq adopted its first flag, "The Kingdom of Iraq." The flag featured black, white, and green horizontal bands and a red triangle inset on the mast side, bearing two seven-pointed white stars, denoting the two Principles in the Kingdom. After the merger of Egypt and Syria in the United Arab Republic in 1958, Iraq and Jordan, which are the two Hashemite Kingdoms, responded by establishing the Arab Federation, an alliance of the two states. The design used to represent this merger was essentially the Jordan Flag without the star, however, this lasted less than six months. The Hashemite Monarchy was abolished in Iraq following the revolution in July 1958 and a new flag was adopted to represent the new republic. This new flag was a black, white, and green vertical tricolor and featured a a yellow circle surrounded by a red, eight-pointed star located at the center of the flag. The red star was representative of the minority Assyrian people and the ancient heritage of Iraq. The black, white, green, and red, the pan Arab colors, whilst the yellow center of the circle represents the sun. The people in the Kurdish minority region of Iraq are still allowed to fly this version of the flag, but the later versions which were used between 1963 to 2008 are forbidden because of the representation of pan Arabism. On July 31st, 1963, after the republic was overthrown, a new tricolor flag of red, white and black with three green stars in the middle was implemented. This flag was representative of the hope for a new United Arab Republic which would consisty of Iraq, Egypt and Syria. Syria hoped for the same and also adopted this flag until 1971 when The Hawk of Qureish replaced the green stars. The flag remained the same during Saddam Hussein's Presidency with the meaning of the three stars being altered to signify unity, freedom, and socialism. Saddam Hussein prompted the phrase "God is Great" in Arabic to be added between the stars in what is said to be Saddam's own handwriting on January 13th, 1991. In 2004 the Iraqi interim US appointed administration adopted a compromise due to an opposition of the abandonment of the flag due to a difference of views. A stylized Kufic script replaced the handwriting on the flag. 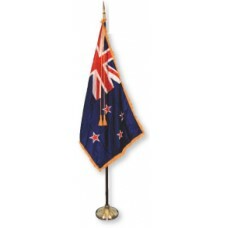 The modified flag was presented at a handover ceremony on June 28th, 2004. 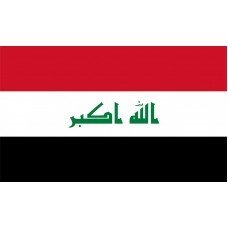 The current version and design of the flag of Iraq was confirmed on January 22nd, 2008. The three stars were removed, but the red, white, and black horizontal stripes remain. 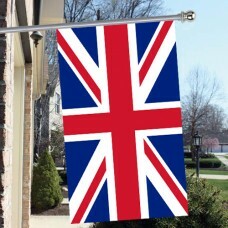 There was an attempt to replace the flag with another design in 2012 as the version was only intended to last for one year but this never came to fruition.